Days like these pop up every now and again. You set off hoping for the best and most times it doesn't quite work out. So it was with slight trepidation I boarded the train in Cardiff on Saturday morning. My mind racing with all the different scenario's that might crop up. Of course the winning scenario kept being played but you always have that nagging doubt. The first part of the train journey went well, we arrived in Birmingham New St on time and alighted the train in search for our connection. Hitch, late announced engineering works meant we had to have the joys of a coach to Leicester. OK if you head there direct but not so funny when it takes a touch over 2 hours visiting the local stations the train would have called at. Still we were in Leicester in plenty of time for some food and a stroll in the sunshine to the Walkers Stadium. From the outside it's similar to several other stadia, especially Swansea's Liberty. On the inside it looks far better. It's a symetrical bowl with no seperately built "sides" or "ends". Great views just the dropping sun causing temporary blindness. The bus journey apart the day was going well. When Chris Barker passed crossfield to Neal Ardley allowing the midfielder to pick out Cameron Jerome with a superb cross the day got even better. Jerome met the ball with a cracking header high into the top corner and 1200 or so City fans went wild. Cardiff threatened to run amok. Steve Thompson shot weakly when in a good position but Leicester started to up the pressure. The Cardiff area was bombarded with balls sent in for the big strikers. City held out until just before the break. A Fryatt effort while challenging with Alexander was deemed to have crossed the line despite Darren Purse's acrobatics. Leicester continued to press and it was good to hear the half time whistle. Dave Jones must have given his players a half time talking to and they were more in the game early in the second half. Jason Koumas, who'd seen the ball fly back and fore over his head in the first half, started to see more possesion and it was Koumas who scored what turned out to be the winner. Steve Thompson was pushed in the back about 20 yards from goal on the right had side of the box that City were attacking. Koumas placed the ball, stepped back and then walked to the ball again to take another look at the angle. 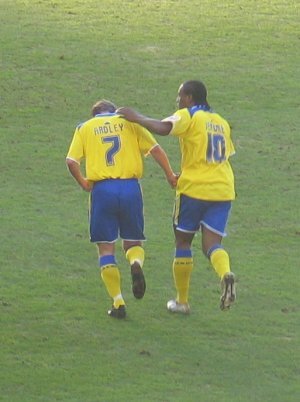 Neal Ardley made a dummy run while Koumas ran up and placed a superb effort over the wall and Douglas in the Leicester goal to score what turned out to be the winner. It was a finish that would have had the pundits drooling if it were Beckham or Henry. Leicester again bombarded the City goal but with Koumas now seeing more of the ball City were managing to threaten themselves. Jerome squandered two great chances. One when through on the right he waited his time and was tackled when an early shot was needed and on the left he was in space but his snap shot / volley was skied. Joe Ledley forced a good save from Douglas but the save of the game came from Neil Alexander. Leicester were pushing for a second equaliser when the ball broke in the box for Fryatt, his effort appeared to be deflected up and over Alexander but the Scotsman extended his arm like "Stretch Armstrong" (Google it) and finger tipped the ball away. Those who saw ITV's "The Championship" programme on Sunday morning were treated to a superb angle for the save. City used all three subs with Rhys Weston being replaced by Willie Boland, Steve Thompson going off injured to be replaced by Kevin Cooper before Cameron Jerome went off to a hero's exit late on. Nsungu came on for the last few mins. Leicester fans had long since given up. The biggest cheer of the day from the home fans came when Levein made a double substitution in the 77th minute, they shouted "Allelujah" soon after the home fans were spilling out with the Walkers Stadium exits gushing supporters like an open wound. The travelling City fans were in full voice and the relief and passion on the final whistle was evident the way the players made their way to the City supporters to thank them for their support. You can see on the players faces that they really to appreciate the fans and winning means something to them. We got a great bunch of players who appear to care. A beer or two on the train on the way home was heartily consumed. (thanks to my lads quick thinking we jumped on a train in Leicester and headed North to Derby. There we picked up the service to Bristol that we were originally planned to meet at Birmingham but would have missed if we had taken the bus. As such we were back in Cardiff by 9.20). 7th in the table. Genuine play off contenders. Three wins from the last four games. A home game next against the team 2nd from bottom. Well done Dave Jones and Cardiff City.